I'm currently reading this book about life as a third-grade teacher. It is hilarious! The author, Phil Done, happens to be a third-grade teacher at my daughter's school. I know a mom with a child in his class, and he seems to be much beloved by his students. I know I would love for my kids to attend his class one day, in particular for Philip and James. There are so few male elementary school teachers, I just think he would be a great role model for the boys. 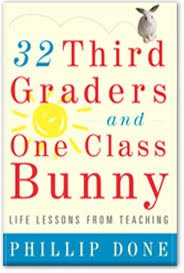 32 Third Graders and One Class Bunny: Life Lessons From Teaching, by Phillip Done.